This will be the third Dakar outing for the Sherco TVS partnership. Dakar Rally set to begin on January 2 will see participation from an Indian rider, Aravind KP, who will take on the most difficult race in the world on a Sherco TVS RTR 450. This will be the first time ever an Indian rider will take part in this race, however for TVS, the world's biggest and the most diverse rally stage is no surprise. This will be the third Dakar outing for the Sherco TVS partnership. TVS Racing resorts its faith in Aravind for his prolonged experience and accomplishments in rally riding on various National stages. It's been 10 years Aravind has been racing for TVS Factory team and has to his name 15 National Championships, that include dirt track, rallies and motocross events. Aravind has on his team Joan Pedrero and Adrien Metge. Pedrero is an 8-time Dakar veteran. His best finishes have been 5th in 2011 and 2013. He also participated in other Rallies such as 2016 Sardinia Rally which he won and the Morocco Rally, where he 7th to cross the line in 2016. Metge is a 30 year old rider with multiple wins in Enduro and Dirt events. He participated in 2016 Dakar for the first time and finished a commendable 11th. Out of the trio of Pedrero, Metge and Aravind KP, Joan is the most experienced. The bike that will be piloted by the three riders - Sherco TVS RTR 450 - was specially developed and manufactured at Sherco Motorcycles. Engineers from TVS will be working alongside the team from Sherco at Dakar 2015. It is a light-weight bike, fitted with a powerful 450cc engine, that produces about 60 bhp. The engine has been designed to provide improved torque on entire rpm range. Further additions to Dakar spec performance are provided by a modified port cross section, redesigned cam shaft, increased compression ratio and re-tuned ECM. The RTR 450 has three separate tanks for 32 litre of fuel. Braking is covered by discs hydraulically activated Brembo 300 mm front and 220 mm rear. It is fitted with Akrapovič exhaust with titanium header pipe, titanium muffler. 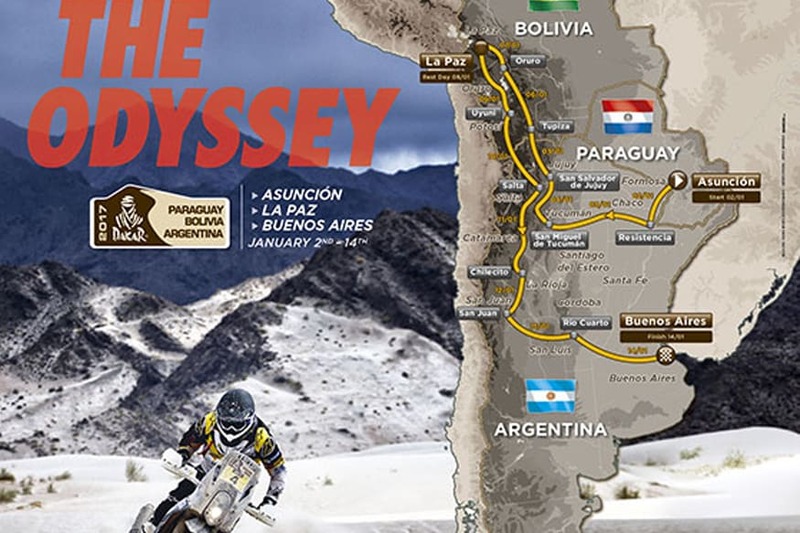 The race will be divided in 12 stages, with the first one being on January 2 Asuncion to Resistencia (454km) and will include motorcycles, quadbikes, cars, UTVs and trucks. Over the next 11 stages, the contenders will drive or ride through San Miguel De Tucuman to San Salvador De Jujuy to Tupiza to Oruro to La Paz. January 8 (Sunday) will be a rest day. The race will be back on on January 9, when the racers will head to Uyuni, and thereafter continue to Salta for the 8th stage. The racers will then pass through Chilecito to San Juan to Rio Cuarto and then finally to Buenos Aires for the 12th and final stage.